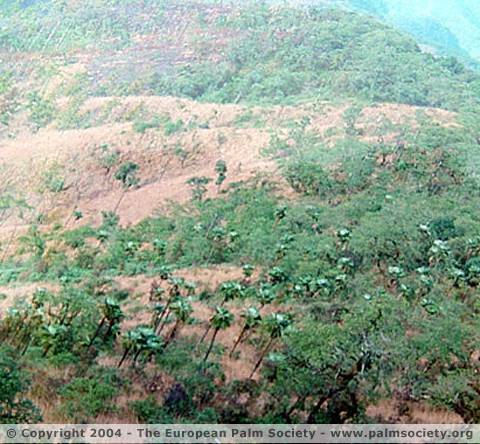 Top row: The Trachycarpus just discovered in the Naga Hills. We will soon know more about the hardiness of the so-called green form of Nannorrhops in a central or western European climate. I will plant my large plant out this spring in one the hottest places in my garden. Of this form I know definitely that a seedling survived at least -19°C and that my large plant has withstood -9°C in January outside in a pot. It stood outside in January for an entire two weeks. There is no doubt in my mind about the green form's hardiness, though that does not mean it is easy to grow here in our humid, icy winters. 'Lumpers' once reduced the number of species of Nannorrhops from 4 to 1. We are not entirely convinced! The Nannorrhops ritchiana that we have been selling up till now is fast growing, and has broad, waxy seedling leaves [now generally accepted in the trade as Nannorrhops sp. (Silver), whereas the green form from Pakistan and Afghanistan is generally found in the trade as Nannorrhops ritchiana, and justly so. Ed.] whereas this very rare plant, recently collected for us in Iran, has narrow, green seedling leaves, is slower growing, and is much more tolerant of both cold and damp as well as drought. 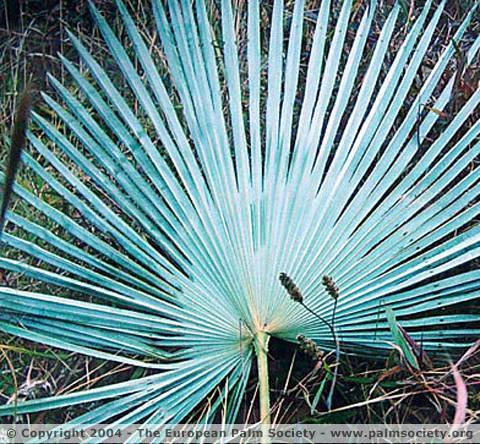 If you are looking for the hardiest, indeed probably one of the hardiest of all palms, this is certainly the one to go for." You can imagine that I and especially Toby Spanner and Martin Gibbons were quite surprised when the seedlings came up extremely fast growing and had silver-blue leaves. I first assumed that Tobias and Martin were probably betrayed by their collectors, but they swore the seeds came from Iran. 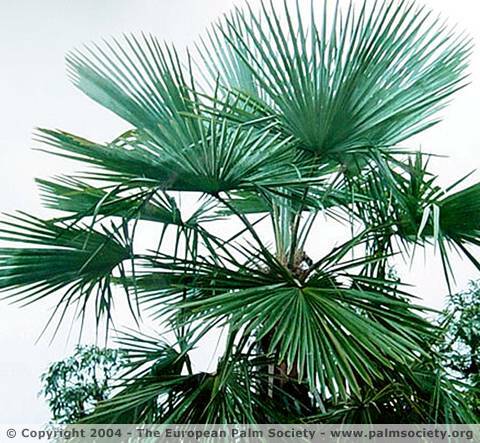 Later, a friend on mine (he lives in southern Austria) told me about the palms near Zahedan, Iran; they were also blue and the temperatures there really get extremely cold, not only just for an hour at night, but often for several days. He said the temperatures there can stay below zero °C for three or four days and that the lakes there freeze. Generally however--apart from those heavy freezes--the climate there is warm and dry. Toby Spanner was still very sceptical about this data when I told him. The problem now is to find out where exactly the Iran seeds available through rarepalmseeds were collected. Does an Iran form with green seedling leaves also exist or was this just wrong information? Maybe it is the same problem with the Iran form(s?) as with the Pakistan forms; maybe some more and some less hardy blue/silver Nannorrhops forms exist and one would have to know exactly where they come from. 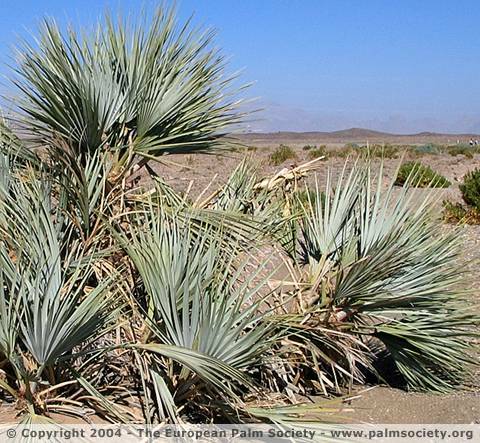 That vast differences in hardiness exist within the same species is also a fact with other desert plants, such as Dasylirion and Agave, for instance. Some Dasylirion wheeleri provenances tolerate -23°C without any problems whereas others suffer severely at just -15°C. I think this might also be the case with Nannorrhops. Maybe plants from lower elevations tolerate only light frosts whereas plants from colder locations are very hardy. But who will be able to find out? What I can do is to try one plant after another. First I'll try the green Pakistan form. If it grows fast enough outside and if it can cope with our winters, then I'll try the next form (and so on and so on). But even that will not prove that all plants from Iran have the same hardiness. 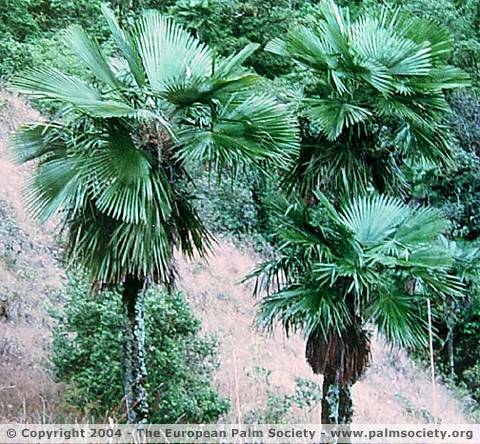 I know that IF there was a hardy Nannorrhops for Central and Western Europe then it would certainly be one of the nicest looking really hardy palms (compared to Sabal minor or Rhapidophyllum for instance). On the other hand, I am very sceptical that any Nannorrhops would be really hardy here. Even if it would be hardy to the temperatures then it will certainly dislike the humid winters in central Europe. At the moment I am almost certain that no Nannorrhops can grow here unprotected. But I hope I'm wrong. Populations of the Nannorrhops sp. Iran with short, silvery-white, seedling leaves are said to grow near here. Year Jan. Feb. Mar. Apr. May Jun. Jul. Aug. Sep. Oct. Nov. Dec. Populations of the classic, hardy form of Nannorrhops ritchiana with long, green seedling leaves grow near here in the Bolan Pass below 1300 m. Seeds available in the trade come from the Harnai and Nakus areas further north where they grow to 1500 m or, according to one source, even to 1675 m.
Climatic data compiled by Federico Oste. Selected and commented on by the editor.